I have an open notepad file on my machine which I don't recall making. Is there a way I can determine what time and day the file was created (registry key or whatnot)? I haven't saved it yet because I don't want to muck up any file stamps, registry entries, etc. So, to be clear, right now, it's "Untitled - Notepad". 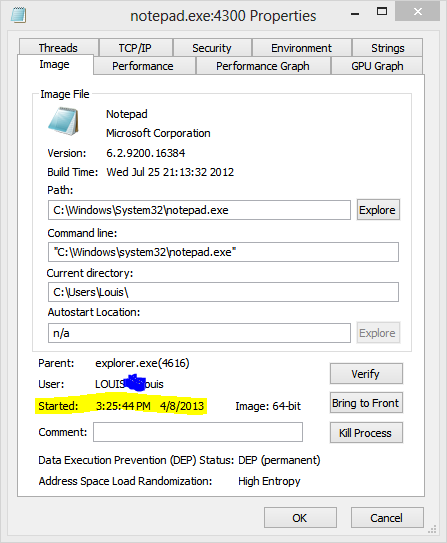 You can use Process Explorer to see what time the Notepad was launched. Not the answer you're looking for? Browse other questions tagged windows notepad timestamp or ask your own question. Is this a serious bug in Notepad in Windows XP? How do I stop Notepad++ taking back file associations? Opened a JPG picture with notepad, pasted all the “text” to a new notepad file, changed to .JPG and it no longer opens. Why? On Windows 7, how do you change the Edit command to use Notepad for xml files, instead of Word?